Published on March 1, 2008 in News and Oregon. 64 Comments Tags: artsy, Barack Obama, Barackappella, civic engagement, lewis & clark college, MoMo and the Coop, oregon, portland, Yes We Can, YouTube. On Friday the 29th, leap day, some members of my a cappella group and I did a benefit show called Barackappella at my college in Portland, Oregon. It was so much fun, I wanted to share the story with you. I support Barack Obama. I am very happy about the phenomenal voter turn out and political participation his campaign for the presidency is inspiring, and I am so excited about what I believe he will do as president. One of the many things I like about Obama is that he inspires action among really diverse groups of people. He inspires different people in different ways, but a lot of us love his speeches. A few weeks ago a group of famous artists put portions of some of his speeches to music, and made a very cool video called Yes We Can. Millions of people have watched it at the original site and also on YouTube, where it was re-posted. I cried the first time I watched this video, and I know I was not alone. It is so nice to hear a “We” instead of an “I”. It is so nice to be so proud of a person who represents our country as a senator, and who I believe will be our President. Words do matter. I feel empowered when I say “Yes I Can,” and I feel even more empowered when I feel connected to something large enough to say “Yes We Can”. I believe more empowerment and civic engagement would be great for our country, and our world. Just days after first watching this video, some friends and I wondered if we could arrange an a cappella version. I was already in an a cappella group at my school called MoMo and the Coop, and I knew that most of the other members were also Obama supporters. Long story short, most members of our group and another friend decided to do a benefit concert, and to call our concert Barackappella. Our performance was one of many “Leap for Change” events nationwide. About eighty people attended, including some of MoMo and the Coop’s fan base, and many Obama supporters we had not seen before. Some in the audience were much younger than me, and others could have been my grandparents. The video above is our version of Yes We Can, we also posted videos of the seven other songs we sang that night. I am the guy with pink pants in the video, in case you were curious. I hope you enjoy it, it was so wonderful for me. By the end of the song my normally confident voice was quivering – definitely a symptom of my strong emotions, not stage fright. The audience really loved it, but I cherish most the proud and excited expressions of my friends who helped build this version of Yes We Can. Thanks guys. The original Yes We Can speech was phenomenal, and the Yes We Can video is probably a lot more impressive musically, but I think our project is special. We are not famous or powerful, I think we are an interesting bunch, but all things considered we are ordinary Americans. But, we are participating in this movement in a way we would not have for any other politician since we were born. We are participating in our own way because a very inspiring person told us that ordinary Americans could do extraordinary things, and now our YouTube video is getting an awesome ton of views. It’s been 24 hours since we performed (to the minute…as I write this), and we have already received some pretty awesome press. The Oregonian covered the event in an article that hasn’t been published yet. The Youtube video already has over 300 views and a bunch of great comments. The site that originally published the Yes We Can video linked to us along with other Dip Inspired projects. We have already received a request to perform this song in other parts of Oregon, and I hope we will. I am so excited. I would like to thank Jon Wash (red shirted guy in video)et al. for arranging this piece, Ben Brysacz (leader of Lewis & Clark students for Barack Obama) for helping promote the event, the lovely audience, Wil.i.am (main creator of the Yes We Can video), and Barack Obama, for inspiring all of us. If you hear of any press/publicity that I have not mentioned in this blog, please do leave a comment to let me know. If you like this story, please post it to your Facebook profile, blog, del.i.cious, etc. Please send us an email at momoandthecoop [at] gmail [dot] com for questions or performance requests. Update: We are now approaching 50,000 views on YouTube and more than 20 comments on my blog here; we really love that people are enjoying the video. Our YouTube fans are leaving some really nice comments, and it looks like we will definitely continue to work on this song, and plan on performing again. A few people have even suggested that we try to sing at the Democratic National Convention. I think people really like that we are just a group of relatively ordinary folk being part of something extraordinary. People seem to be enjoying our efforts more because we are less famous, and closer to the grassy roots – that’s pretty different from traditional campaigns isn’t it? What do you all think? DNC? Update II: Barack the Vote! Over 65,000 views and we recently performed again at a Barack the Vote rally at Lewis & Clark College. I think Obama is more than popular enough to win Oregon, our great challenge right now is registering voters. I grew up in conservative central/eastern Oregon, and I now attend one of the most progressive schools in progressive Portland Oregon. The Obama campaign is really the first time I’ve been able to talk with friends from school, friends from home, and family, and everyone is excited about the same thing. This movement for change has captured the attention of a very broad swath of Oregon’s great political diversity, and so now we really just need to focus on getting everyone registered to vote (due to Oregon’s mail in ballot, you must be registered by April 29th, 20 days before the actual primary, find more info on registering to vote here). We were also honored to have Congressman Earl Blumenauer speak about why Obama inspires him. After it was all over we had pizza and doughnuts with the Obama logo on the frosting. It was a fun and I think successful event. Thank you so much everyone for encouraging me and my group to keep being part of the Obama movement. Published on September 2, 2007 in Faith and Oregon. Closed Tags: dignity village, homelessness, lc leadership & service office, operation nightwatch, portland, poverty, service. James builds Dignity Village by Isaac Holeman. I met this guy the other day, I guess we can call him James. His shirt says he’s Good For Nothin, but he looks like a worker to me. James is a member of Dignity Village, which doesn’t help to clarify James’ “status.” Part protest, part political experiment, part pragmatism in the face of desperation, Dignity Village was founded by a group of homeless individuals who set up a camp on the waterfront to protest their housing situation. 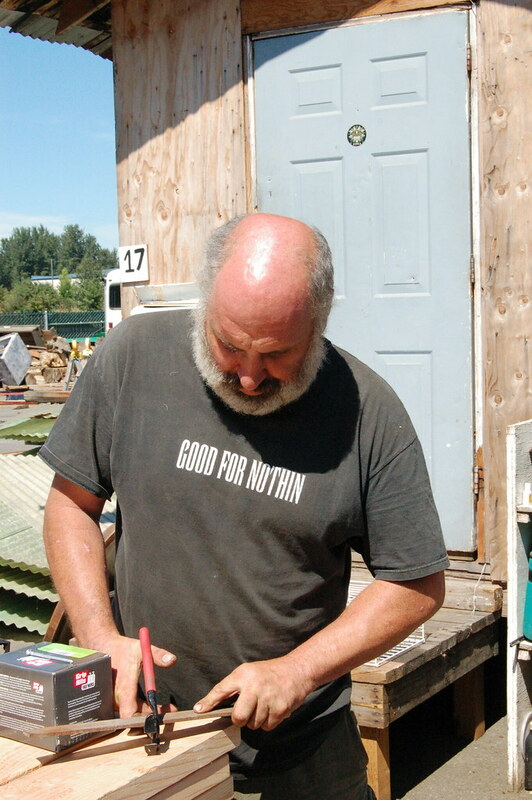 According to Erik Stenn, Portland’s progressive city commissioner, the business community was upset, but Stenn “didn’t see any reason for moving them.” Dignity Village gained a beachhead on what it is today when Stenn and other individuals worked to find them a permanent piece of land for their squatters camp. Many of the initial tenants have gone, but Dignity Village is now on a small concrete lot near the airport. In my opinion, the most interesting aspect of Dignity Village is how it calls into question the nature of homelessness. Once given a place to call community, James built himself a home. He used mainly the scraps that others had thrown away, and built for himself a comfortably humble place to stay warm and call his own. I don’t know James’ entire history, I didn’t ask. But when I watched, and helped him work it became shockingly clear that, if he had been homeless before, it was not just a house he was missing, per se. He was not too lazy, to drug addicted, to crazy, or too short sighted to build himself a home. This experience really made homelessness itself seem more a state of social exclusion than a condition of material haves and have nots. I had a similar experience later that week working at Operation Nightwatch. Operation Nightwatch is guided by the premise that people who sleep outside need friends too, in fact, if they are sleeping on the street, they could probably use a friendly gesture even more than the rest of us. Operation Nightwatch is a drop in center where individuals can come to drink a cup of coffee, eat a sandwich, get a clean pair of socks if they are needed, and just know that they will find a friendly change of pace from contemptuous streets. When there are enough volunteers, as was the case the evening I worked there, the volunteers spend a lot of their time just playing scrabble, or a card game, of just chatting with the dozens of nightly visitors. After helping make a huge batch of tuna fish sandwiches, I sat down to play a game of scrabble with a man that might have been named Eric. Wearing a red and green Christmas plaid with slacks and beard in shades of grey, Eric could have been Father Christmas’ oddball skinny uncle. Eric was pretty quiet, other than exuberant ho-hums and giggles when he found a new word. While we played I listened in on the table behind me – an engaged group of “the least of these” talking politics. The wide ranging discussion touched on coercive monopolies, the pragmatic failures of Marxism, the origins of an unrestricted or “free” market in Belgium, and of course, global hegemony. I couldn’t help but remark that I do not know very many people that could have actively followed and contributed to this conversation. I definitely know people with PhD’s who would have been flat lost. Why do people become homeless? I was wondering. I recommend you have a good chat with a few. Everyone has problems, but they are not as stupid/dumb/crazy/lazy/mean/addicted/scary as everyone is led to believe. What is it that makes them different enough to merit asphalt rather than a bed at night? And why do I justify that unless I am choosing to do some service, I try not to acknowledge them when they ask me for the change I don’t really need. They way I had perceived (or strategically avoided perceiving because of guilt) homeless people was feeling kind of crazy when Eric giggled a little and then placed the letters S A N E on our crowded scrabble board. I ended my work with Dignity Village and Operation Nightwatch ready for a good hard think. I think thinking like this often leads to thanking, and that was the case this time. I keep remembering a word Eric taught me. Oh, yes, Eric told me he speaks Hebrew. Slightly skeptical, I asked him to teach me a word. He said it would be good for me to know the word Teshuva, it means repentance or a return to God. It really is crazy what the “crazies” learn at the public library these days. Published on August 19, 2007 in Oregon. Closed Tags: environment, portland, sports. Undertake a non-motorized crossing of the Williamette River (in the water, not on the bridges). For boatless chaps like me, this means swimming. My initial thought was to the distance. It’s a broad river, but I knew I could make it. A fine and worthy challenge I thought, given that the event was a fundraiser for an orphanage in Kenya. Then I remembered learning about the Willamette during an Ecology and Environmental Studies course my freshman year. The Willamette is gross. Gross in a very well-founded, tangible, and chemical sense. The Wikipedia article on the river puts it nicely. The Portland Harbor section of the Willamette River between downtown Portland and its terminus at the Columbia River is heavily polluted from years of industrial development of the river and its banks. Historical and current activities have included shipbuilding, creosote manufacture, and transfer and storage of petroleum products. State studies in the 1990s identified a wide variety of pollutants in the river bottom, including heavy metals, polychlorinated biphenyls (PCBs), and pesticides. Later, the article goes further. In the Portland Metropolitan Area, these issues are exacerbated by Sewer Overflow Events during periods of high rainfall. As of the fall of 2005, according to my professor, a new pipeline was being constructed so that the sewage didn’t usually overflow, but the capacity here was insufficient, so the raw sewage would spill into the river during heavy rains. For those of you who do not live in Portland, you probably guessed it. It rained last night. Suffice it to say that while thrilled by swift and profound waters, I was cowed by drifting turds. Perhaps I will swim the Willamette after it has had some time to flush itself.